On Sunday 17th March 10 counties met at Cambridge Hills Road to play the 8u inter-county event. 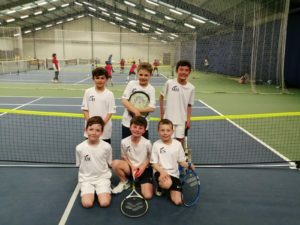 The counties that played in our event were Essex, Suffolk, Hertfordshire, Cambridgeshire, Oxfordshire, Bedfordshire, Buckinghamshire, Berkshire, Northamptonshire, and Norfolk. The teams had to get 6 girls and 6 boys in each team. The girl’s event was in the morning and the boy’s in the afternoon. The counties were split into two boxes, and the children were numbered 1-6, each county played the other counties in their box and the players played their corresponding number. The girl’s had Hertfordshire, Oxfordshire, Suffolk, and Northamptonshire in their box. 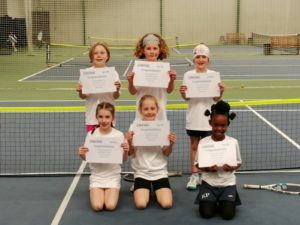 Playing for the girls were Khensani Pfute, Esme Atherton-Howlett, Sophia Butwright, Anna Clayton, Amelia Berdnarska and Mollie Howard. It was a tough start for the girls losing to Suffolk 1-5 with Anna having the only win. Then we played Hertfordshire which were a league above the rest in our group, and we lost 0-6. Next up was Northants and the girls had some closer matches but just Esme managed the win making it a 1-5 loss. We could see the girls getting a little down now so we had a team talk and picked them back up as every game counts. Lastly in the box was Oxfordshire, a must win match if we didn’t want to play off for 9th and 10th place, which we didn’t! Mollie, Amelia, and Anna all losing close matches they could have won. So we were 0 -3 down with a lot of work to do. However Sophia, Esme and Khensani picked their games up for the team and all won very close matches. This meant we drew 3-3 with Oxfordshire but managed to finish above them in the group as we won one more rubber than them. The girls therefore then played a play off for places 5-8. They had to play Bedfordshire first, this round was probably the round the girls played their best, they had all picked their level up. Unfortunately we lost 2-4 with Amelia and Esme winning. We then played Northamptonshire again for 7th and 8th place which again the girls tried really hard and played some of their better tennis but lost 1-5 with Sophia winning this round. Overall Norfolk girls finished 8th . The boy’s team was made up from Raffy Pantazis, Mark, Devaney, Austin Richardson, Theo Chipperfield, George Head and Elliot Seadon. In the boy’s box were Suffolk, Hertfordshire, Berkshire, and Bedfordshire. The boys started with Berkshire, Norfolk got off to a great start and went 2-0 up with Elliott and George both winning close matches 10-8. Unfortunately none of the others in the team managed to convert their matches to wins, therefore Berkshire winning 2-4. Next up was Hertfordshire which similarly to the girl’s the Hertfordshire boys were a league above the rest in our box. Hertfordshire won 0-6 however all of the boy’s worked hard and didn’t give up. It was a similar story when the boys had to play a very strong Bedfordshire team with Austin having the closest match narrowly losing 8-10. Lastly we had Suffolk who had also struggled a little in their box matches. Elliot had a fantastic close match which he won 10-8, unfortunately no one else was able to convert their matches. Mark losing a very close match 9-10! The boys finished 5th in their box so were playing for 9th and 10th place. They had to play Northamptonshire; we were 1-1 after the first round with George winning convincingly 10-1. Theo and Austin had close matches but both narrowly lost so we were 1-3 down. Mark and Raffy both won their final matches to make the score 3-3. The boys won on points against Northamptonshire to finish 9th. Both the girls and boys teams worked really hard, and learnt a lot on the day. It was high level competition and great for the children to experience. Thank you very much to the parents for their support.